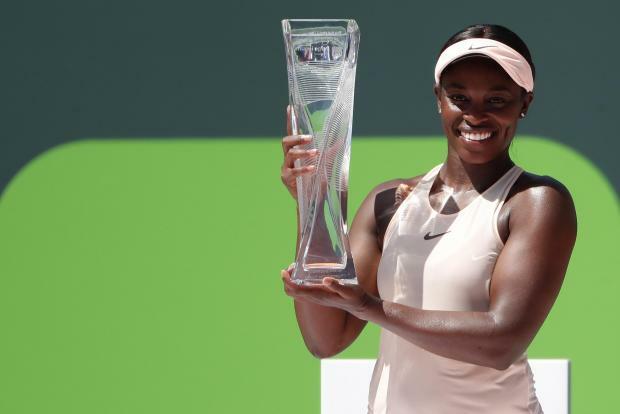 American Sloane Stephens kept intact her streak of never having lost a final as she defeated Latvia's Jelena Ostapenko 7-6(5) 6-1 to claim the Miami Open title on Saturday. After a tense first set, the U.S. Open champion reeled off six consecutive games in the second to stop the French Open winner and claim her first Miami title after a slow start to the season. "I wasn't expecting a title here or anywhere really, I just wanted to make sure I got my game back where I wanted it to be," Florida native Stephens said in a courtside interview after extending her record in finals to 6-0. The crowd favourite had just six winners to 25 for Ostapenko, but 48 unforced errors by the Latvian and Stephens' relentless defense were the difference. The men's title will be decided on Sunday with American John Isner going for the biggest win of his career against Germany's Alexander Zverev.